If you think we’re living in a world of hurt, then Ross Jackson has a concrete plan that will certainly interest you. 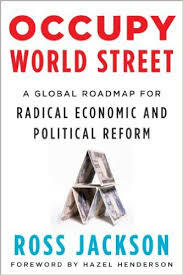 ‘Occupy World Street: A Global Roadmap for Radical Economic and Political Reform’ begins with a straightforward, well written analysis of the problems that confront us. It’s rather amazing — and depressing — but that’s the easy part. The hard part is figuring out what to do, or even if anything can be done. Jackson has that covered too, and he’s pretty convincing. ‘Occupy World Street’ seems like a fine focus for the demonstrations that call themselves “Occupy.” We might not all agree on all the details, but Jackson’s layout is impressive, concise and clear. If you’re going to propose a solution, then you need to describe the problem, and Jackson’s descriptions are well thought out and very organized in approach. There are seven parts, with each part divided into chapters. The ecological challenges are covered in “Planet Under Siege,” the economic challenges in “Drivers of Destruction,” and the political hurdles in “The Empire.” Jackson writes with passion and precision; he doesn’t mince words, he borrows from smart established thinkers and he knows how to get the reader “het up.” He’s a great guide to the edge of the cliff. The worth of this book is that Jackson has a set of ideas and plans to get past the cliff without exactly jumping. He’s the founder of the Gaia Trust, so the plan has a Gaian outlook, which should tell you a bit about both where Jackson comes from and where he is headed. The three remaining parts of the book map out the underlying philosophy in “New Values, New Beliefs,” set out some basic organizational tools in “Towards a Gaian World Order,” and then lay down concrete steps of how to achieve the Gaian World Order in “Getting There,” with what he calls “The Breakaway Strategy,” the title of the final chapter and the culmination of all that has preceded. Here’s where Jackson sounds up all the pieces and gives readers a quite doable, concrete plan for getting from the current mess to a world that is sustainable and fair. Of course, different readers will have different views of the “doability” of Jackson’s plan, which involves forming a new set of world bodies to manage the environment and the economy. His plans don’t involve raging down the street and breaking the windows of those unfortunate enough to be located there. It is utterly and consistently clear that something is really wrong today with the way the world is being run. The “Occupy” protests have done a fantastic job at focusing our attention on the problem. ‘Occupy World Street’ gives us a solution — if not the solution, certain a great set of tools with which to talk about any sort of solution. There’s a web site you can go to, but the book is going to be your key. Ross Jackson good questions, good answers and writes them well. With ‘Occupy World Street,’ reading becomes an action — but only the first action. The rest is up to you.